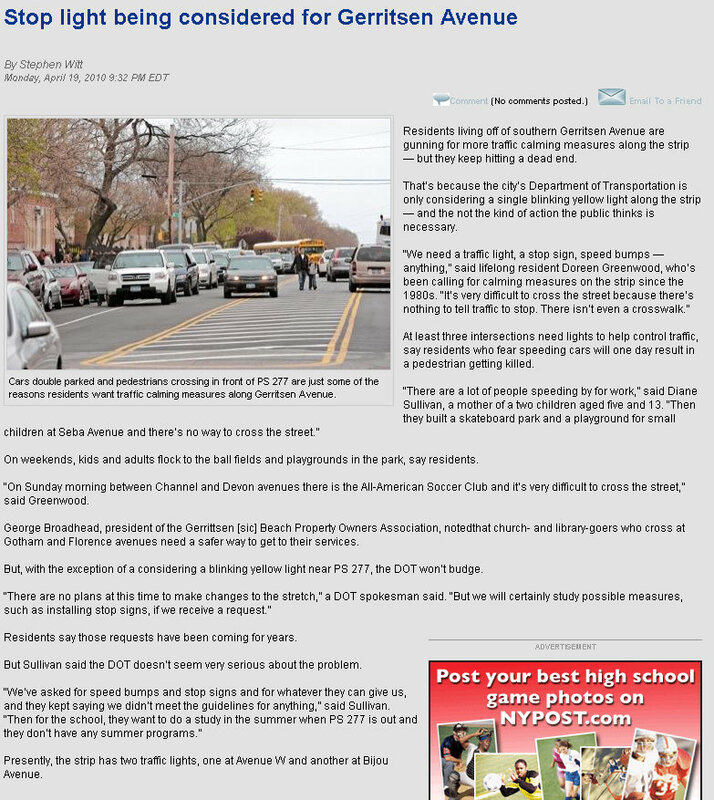 Our neighborhood downtown Brooklyn based community paper recently picked up on the possibility of a traffic signal on Gerritsen Avenue. Maybe they picked up the story out of thin air because they weren’t at the meeting. Even though they added nothing to the story at hand, they did add additional exposure – which in the end is good for us. Residents living off of southern Gerritsen Avenue are gunning for more traffic calming measures along the strip — but they keep hitting a dead end. That’s because the city’s Department of Transportation is only considering a single blinking yellow light along the strip — and the not the kind of action the public thinks is necessary. At least three intersections need lights to help control traffic, say residents who fear speeding cars will one day result in a pedestrian getting killed. On weekends, kids and adults flock to the ball fields and playgrounds in the park, say residents. “On Sunday morning between Channel and Devon avenues there is the All-American Soccer Club and it’s very difficult to cross the street,” said Greenwood. George Broadhead, president of the Gerrittsen [sic] Beach Property Owners Association, notedthat church- and library-goers who cross at Gotham and Florence avenues need a safer way to get to their services. But, with the exception of a considering a blinking yellow light near PS 277, the DOT won’t budge. Residents say those requests have been coming for years. But Sullivan said the DOT doesn’t seem very serious about the problem. Presently, the strip has two traffic lights, one at Avenue W and another at Bijou Avenue. Look at this guy and his kid, crossing against the light in the middle of the street. The cars clearly have a green light and he is not in the crosswalk. Never mind that, he should be charged with endangering the welfare of a child. What a jerk taking that kid out where you see all that chaos and YOU have a red light, Frank, get a grip, he's wrong whether the cars are there legally or illegally. That's right. That lane is "designated only" for skateboarders and bikes. Well, its a well known fact that the Coruier Life publications are rather slow on the uptake. And we know that they rely heavily on their unpaid staff of local bloggers, who aren't even aware that they are working for Courier-Life. Until their work ends up there. Stephen Witt has had a lot of stories lately the dovetail with local blogs. He says his reporting is "just a paycheck," then doesn't actually do the work for that paycheck. I attend a lot of meetings in the area and have only seen him once in the last several months. Stephen Witt telephoned me about 4 or 5 times while gathering information for his article. Although it seemed redundant, more media coverage may be beneficial to the needs of our community, so I was receptive. Given the opportunity, I suggested young parents who are from Gerritsen Beach, and are raising their own children here. He was able to reach Diane Sullivan, but was not able to reach others. I also suggested he contact Doreen Greenwood as one who grew up here, and because of her unique knowledge of the beach, through real estate and the "Vollies". Many people have a problem with the "grabber" headlines the young crop of journalists use, but they seem to serve the purpose: getting us to read further. I disagree with his, "Blinking yellow light won't cut it on Gerritsen Ave.", if for no other reason than, we want something, and if the only thing we can get is a blinking yellow light, at least it's a foot in the door. Senator Marty Golden has been working on that…. Councilman Lew Fidler is the person who has been lobbying for a light at Seba Avenue. Don't be shy, keep reminding them! “Keep it the way it is”, isn’t good enough anymore. The traffic problems have increased because the population increased. You need to get real anonymous. We don’t have dirt roads anymore in the old section either. Changes have come to Gerrittsen over the years and safety should always come first. Please open your eyes. We are now in the year 2010. Nothing is the way it used to be. There has just got to be more enforcement around here! Saturday, the Ave was busy, St. James had a Flea Market, it was a beautiful day and lots of people were out, interrupted constantly by the roaring of dirt bikes and ATV’s up and down the Ave. There were scores of them coming in and out of the parkland all weekend. Why are they allowed to go back there and damage the park, and disturb the peace for everyone else? The city needs money, they should start going after these morons, fine them and confiscate the bikes. It is way out of hand.